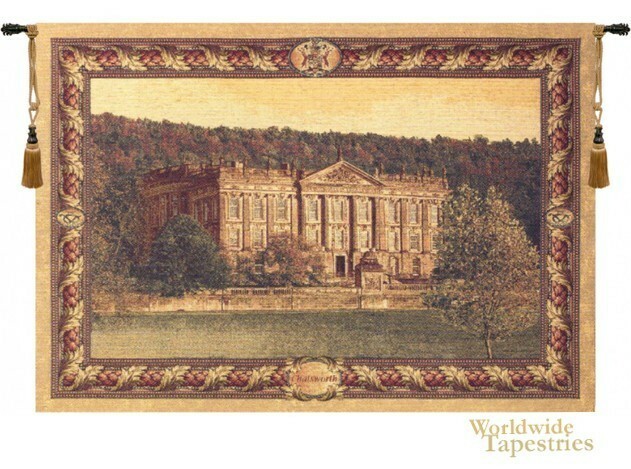 This castle tapestry depicts the famous Chatsworth castle nestled in its lovely grounds in Derbyshire. This English castle is a wonder in that it's a treasure trove of drawings, sculpture, and priceless paintings and other artifacts. This tapestry captures the west view of the castle, which was originally built in the 1500's and since has been the home to the Dukes of Devonshire. The castle stands on the east bank of the river Derwent. Renowned for it's beautiful and elegant character and form, this castle is surrounded by some of the most beautiful countryside in England with over 1000 acres of gardens. Inside lies the 19th century Library, Great Dining Room and Sculpture Gallery and this home is much admired by visitors daily. Chatsworth castle tapestry is unlined and has a tunnel for easy hanging. Note: tapestry rod and tassels, where pictured, are purchased separately.